Aqua, a planet only recently made habitable by terraforming and advanced science. Overflowing with water and sprinkled with island-cities, Aqua encourages a slower, relaxed pace of living. Our story follows Mizunashi Akari – a young woman training to become an undine (the female version of a gondolier). The lively canal-filled Italian-inspired city of Neo-Venezia is both Akari’s playground and training course. She belongs to a small tourism company called Aria Company, and manages the company alongside her teacher Alicia and their cat President Aria. Joining Akari are Aika and Alice, both of which work for different tourism companies but train together on a daily basis. They work on perfecting their undine skills, which consist of majestically stirring the gondola, entertaining customers with Neo-Venezian trivia and occasionally singing. Their dream is to become a Prima (highly professional and coveted undine) and reach the high bar set by their teachers. Aria The Animation is arguably the anime that singlehandedly invented the Iyashikei (soothing/comforting) genre. Created before the age of moe, it is a slow-paced scenic series that practically forces you to become laid back and enjoy the moment. And enjoying the moment is at the heart of what Aria is all about. You won’t find action, excitement, sexual references or shocking moments here. The plot is very simple and Akari and her friends are seen and heard doing mundane things as days and seasons pass by. Instead of relying on big twists or exciting endeavors Aria celebrates the mundane and in so helps us appreciate the simpler things in life. The girls guide us through the watery tunnels and canals of the city, at times interacting with the other residents or discovering a beautiful new place that could only exist in the surreal environment that Aqua provides. Although the series does take place in the distant future the overall look and feel of Neo-Venezia is intentionally retro (it was created to mimic the old city of Venice which by that point in time no longer exists). The music, with its moderate yet playful use of guitars and cello, also contribute to this classy image. I found most of the characters to be unique and interesting (if not always realistic). The three girls all have strong defining characteristics – Akari is an optimistic airhead, Aika is strict and caring and Alice is polite to a fault. Even the three Prima who double as their teachers – Alicia, Akira and Athena – have quirky and special features that clearly define them. Possibly the only mentionable story issue I found in Aria The Animation is how naïve and protective it is. Akari and her friends are cherished by all the townspeople. No one thinks badly of them, no one would dream of insulting them or even dare to not smile back at them when they greet him/her. It’s a bit overdone and unnatural, to say the least. Akari herself act and react too perfectly to be considered a real person. 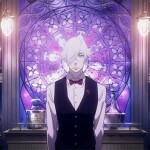 But whether this over-optimistic take on life is a real problem is debatable, since this same protective and soothing environment is also in part responsible for the series’ Iyashikei properties. Not so debatable is the series most noticeable technical issues. Aria The Animation was created shortly before the jump to HD visuals and while the static backgrounds and 3D animated water look impressive the same cannot be said about the characters. They look blurry or lack detail from afar and suffer from apparent aliasing (pixilation) when seen up close. Amazingly the DVD menus that Right Stuf created are even more pixelated, hinting at a mediocre mastering alongside the unfortunate age of the show. The other aspects of this DVD release are so-so. I loved the wooden box the series DVDs came in, but hated the fact that each DVD has its own plastic case. Changing between DVDs forced me to pull all the DVD cases out of the box and open two cases each time before shoving the DVDs back into the box. It takes away from the experience and doesn’t necessarily protect that DVDs better. Aria is a subtitles only release and I did find some embarrassing translation mistakes in the early episodes, but thankfully the translation is spot-on for the most part. There are a lot of nice extras for Aria, both physical and digital. I especially liked the thick guidebook that comes in the box and the “Venice, I’m Sorry!” specials which show how Neo Venezia stacks up to our modern day Venice. As an emotional and comforting journey Aria The Animation is almost unrivaled. The wonder-filled Neo-Venezia and the unique undine that glide across its waters really offer a different perspective on life. The series doesn’t look all that stellar and I wish Right Stuf would focus more on the quality of the mastering instead of the frills that surround it. That said Aria has so much hidden value, and is such a pace-changer, that I cannot recommend it enough. - Neo-Venezia is both charming and comforting. 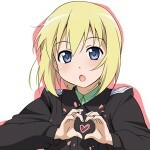 - Akari's optimistic look on life will brighten even your darkest of days. - The series suffer from acute pixilation issues. 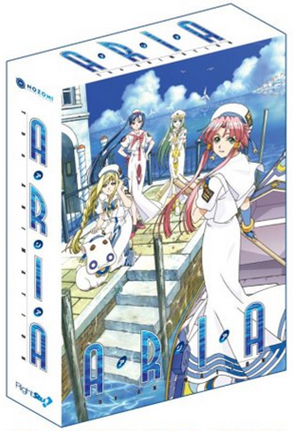 Product Information: Aria The Animation (Season 1). Published by Right Stuf. Release Date: September 30, 2008.
Review Equipment: A Samsung 32-Inch LCD HDTV (LA32B530) connected to a PS3 using a ver. 1.4 HDMI cable.